A tec is a system integration specialist. 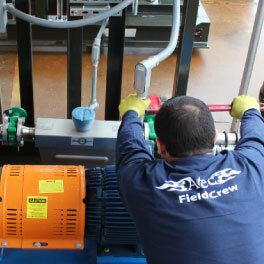 We integrate new systems, as well as replace unreliable components in existing facilities. As Atec began as an instrumentation OEM, our integration of electronics and software remains world renowned. We bring mechanical components into skids and packaged products, and those packaged products get integrated into full systems or facilities. Atec has an excellent Supplier Management Program where our suppliers are identified, surveyed, assisted, monitored, and rated. Vital Link, Hager and Celtech bring huge machining and fabrication ability to our team. Over half of our production comes from outsourced components integrated into Atec systems. We provide total facility integration for new and upgrade construction, including electrical and piping impacts, facility layouts, and storage, safety and transportation requirements, while maintaining compatibility between new and existing systems. One of Atec’s proven strengths is long term sustainment by upgrading and fitting procurable COTS gear into legacy systems and installations. Refreshing or replacing legacy systems enhances performance and improves the efficiency of the existing facility. A recent success had Celtech adding EDACS control system to a T-20 test cell to control F404/414 engines for a Pacific Rim ally. Atec can engineer specific technology refreshments to older gear, and can usually address obsolescence in Space Corp., Page Avjet, Knight Aerospace, ASE, Celtech, Vital Link, Exceletech, IAC, Hager and of course, Atec items.